Montreal, Toronto, Vancouver, Copenhagen, Johannesburg, London, Los Angeles, New York City, Newburyport, Paris, Portland, San Francisco, San Jose, Santa Monica, Stockholm, Sydney, Tokyo, Tshwane & Washington D.C. make bold commitment ahead of Global Climate Action Summit. 3 Canadian mayors, alongside 16 mayors from around the world, representing 130 million urban citizens, committed to significantly cut greenhouse gas emissions from their cities by ensuring that new buildings operate at net zero carbon by 2030. 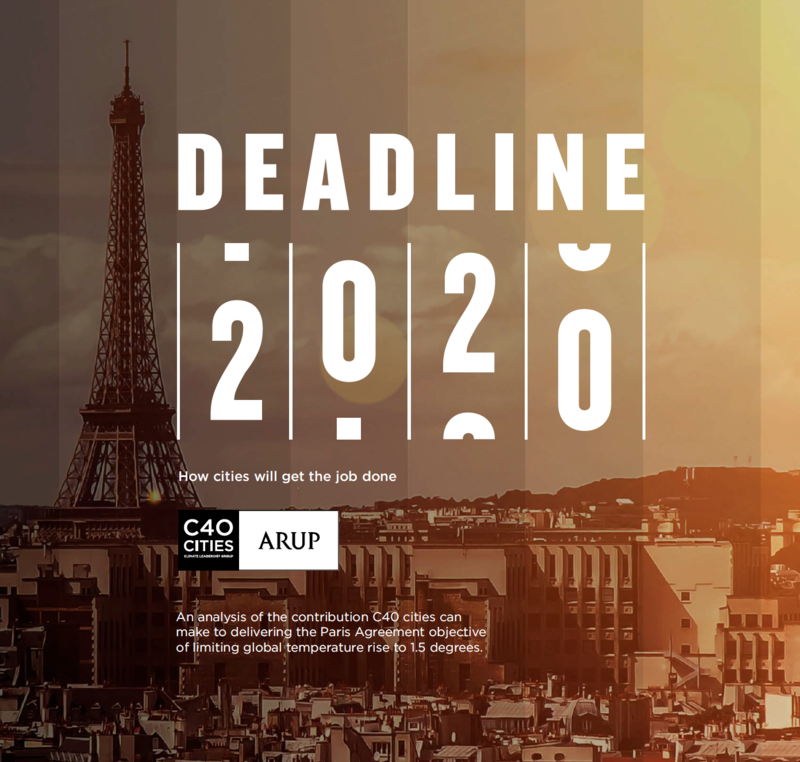 By signing the Net Zero Carbon Buildings Declaration, the leaders of Montreal, Toronto, Vancouver, Copenhagen, Johannesburg, London, Los Angeles, New York City, Newburyport, Paris, Portland, San Francisco, San Jose, Santa Monica, Stockholm, Sydney, Tokyo, Tshwane & Washington D.C also pledged to ensure all buildings in the cities, old or new, will meet net-zero carbon standards by 2050. Net-Zero Buildings use energy ultra-efficiently and meet any remaining energy needs from renewable sources. Such bold commitments made ahead of the Global Climate Action Summit in San Francisco, are essential steps in delivering on the highest goals of the Paris Agreement and keeping global temperature rise below 1.5℃. Buildings in urban areas are one of the largest sources of greenhouse gas emissions and typically account for over half of a total city’s emissions on average. In London, Los Angeles and Paris, buildings account for well over 70% of the cities’ overall emissions, creating an enormous opportunity for progress on bringing emissions down. Currently, half a million people die prematurely each year due to outdoor air pollution caused by energy used in buildings. “We are excited to be signing the C40 Net Zero Carbon Emissions Declaration along with other major cities around the world. Vancouver’s Zero Emission Building Plan will not only reduce GHG emissions from new buildings by over 60% but is also driving our green economy with a 53% increase in green building jobs since 2010,” said Mayor of Vancouver Gregor Robertson. Delivering on the commitments made today will require a united effort, as city governments do not have direct control over all the buildings in a city. This commitment includes a pledge to work together with state and regional governments and the private sector to drive this transformation and calls on national governments for equal action. This pledge from cities is part of the World Green Building Council’s Net Zero Carbon Building Commitment for Businesses, Cities, States and Regions. ● Establish a roadmap for our commitment to reach net zero carbon buildings. ● Develop a suite of supporting incentives and programmes. ● Report annually on progress towards meeting our targets, and evaluate the feasibility of reporting on emissions beyond operational carbon (such as refrigerants). ● Evaluate the current energy demand and carbon emissions from their municipal buildings, and identify opportunities for reduction. ● Establish a roadmap for their commitment to reach net zero carbon municipal buildings. ● Report annually on progress towards meeting their targets, and evaluate the feasibility of including emissions beyond operational carbon (such as refrigerants). “Copenhagen fully supports the Net Zero Carbon Building declaration. Copenhagen must lead the way in terms of creating green solutions that inspire other large cities and we are constantly trying to improve. Last year Copenhagen won C40’s prestigious climate award for our efforts in making our buildings more energy-efficient and climate-friendly. Moving forward we are committed to becoming even greener to reach our goal of becoming the world’s first co2-neutral city by 2025,” said Lord Mayor of Copenhagen, Frank Jensen. C40 Cities connects 96 of the world’s greatest cities to take bold climate action, leading the way towards a healthier and more sustainable future. Representing 700+ million citizens and one quarter of the global economy, mayors of the C40 cities are committed to delivering on the most ambitious goals of the Paris Agreement at the local level, as well as to cleaning the air we breathe. The current chair of C40 is Mayor of Paris Anne Hidalgo, and three-term Mayor of New York City Michael R. Bloomberg serves as President of the Board. C40’s work is made possible by our three strategic funders: Bloomberg Philanthropies, Children’s Investment Fund Foundation (CIFF), and Realdania. WorldGBC's Net Zero Carbon Buildings Commitment promotes leadership through ambitious trajectories for action from Businesses, Cities, States and Regions for owning, occupying and developing net zero carbon portfolios by 2030. It sets a level of ambition that will create unprecedented demand, stimulating the market to deliver net zero carbon buildings at scale. The World Green Building Council is a global network of Green Building Councils that is transforming the places where we live, work, play, heal and learn. The goal is to help reduce the building and construction sector’s CO2 emissions by 84 gigatonnes and ensure all buildings have net zero emissions by 2050. We believe green buildings can and must be at the centre of our lives. Our changing climate means we must reshape the way we grow and build, enabling people to thrive both today and tomorrow. We take action – championing local and global leadership and empowering our community to drive change. Together, we are greater than the sum of our parts and commit to green buildings for everyone, everywhere. The Global Climate Action Summit takes place Sept. 12-14, 2018, in San Francisco under the theme “Taking Ambition to the Next Level.” To keep warming well below 2 degrees C, and ideally, 1.5 degrees C—temperatures that could lead to catastrophic consequences—worldwide emissions must start trending down by 2020. The summit will showcase climate action around the world, along with bold new commitments to give world leaders the confidence they can go even further by 2020 in support of the Paris Climate Change Agreement. The summit’s five headline challenge areas are: Healthy Energy Systems, Inclusive Economic Growth, Sustainable Communities, Land and Ocean Stewardship, and Transformative Climate Investments. Many partners are supporting the summit and the mobilization in advance including Climate Group; the Global Covenant of Mayors; Ceres, the C40 Cities Climate Leadership Group; BSR; We Mean Business; CDP, formerly the Carbon Disclosure Project; the World Wide Fund for Nature; and Mission 2020.